Sometimes the internet is a terrible terrible place, like FaceBook before an election. But sometimes the internet is supes awes sauce. 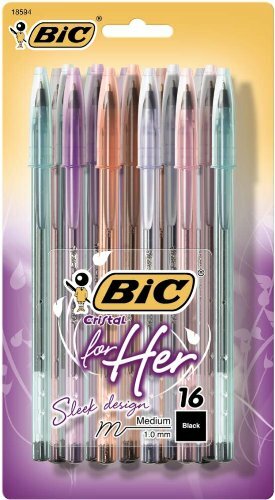 Bic made a pen especially for the ladies because their standard ball-points have always been far too masculine for our delicate hands, obviously. "Someone has answered my gentle prayers and FINALLY designed a pen that I can use all month long! I use it when I'm swimming, riding a horse, walking on the beach and doing yoga. It's comfortable, leak-proof, non-slip and it makes me feel so feminine and pretty! 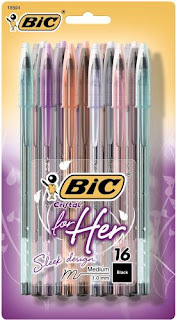 Since I've begun using these pens, men have found me more attractive and approchable. It has given me soft skin and manageable hair and it has really given me the self-esteem I needed to start a book club and flirt with the bag-boy at my local market. " " I am a female AP and Multivariable Calculus teacher and I prefer to use ink when solving problems. I guess, not surprisingly, these pens cannot be used to do math problems more complicated than 5th grade level. When trying to find a derivative or definite integral, the ball point simply stopped working. I went back and added some numbers and it was fine. I progressed up to solving quadratic equations and the ball point started to "stick" so that I couldn't solve the problem completely. Imaginary numbers? HA! It was as if I had a pen with imaginary ink! As I moved into problems with Taylor Series, the pen started to get uncomfortably warm. By the time I tried to find the integral of a polar curve the pen burst into flames! I couldn't believe it! Luckily, I had on asbestos gloves by that time so there were no injuries. I couldn't even try it with a Multivariable problem!" Thanks for making the internet great, strangers. this is hilarious. I have been laughing about it all day, and I'm SO glad you shared it. It reminds me of this http://www.youtube.com/watch?v=SjxY9rZwNGU video that Cary showed me in college. I still joke about the Gold Standard sometimes. Thank you for making me laugh out loud. It was a nice break from grading papers. Britt, the funniest part of that video is the second youtube comment.